MONTREAL — Curtis McElhinney stopped 48 shots as the visiting Carolina Hurricanes defeated the Canadiens 2-1 on Tuesday night in Shea Weber’s return from injury for Montreal. Victor Rask and Trevor van Riemsdyk scored for the Hurricanes (12-9-3), who have won four of their past five games. McElhinney, who’s emerging as the top goaltender in Carolina, made 21 saves in the third period alone for his fourth straight victory. Phillip Danault scored the only goal for the Canadiens (11-9-5), who extended their losing streak to five games. Carey Price made 20 saves in defeat. Weber played in his first game since Dec. 16, 2017 and it was his first time wearing the captain’s “C” on his Montreal sweater. The 33-year-old defenceman missed 73 games after having two surgeries — one on his right knee and another to repair a torn tendon in his left foot. To make room for Weber’s return, defenceman Karl Alzner was put on waivers and then assigned to the American Hockey League’s Laval Rocket. 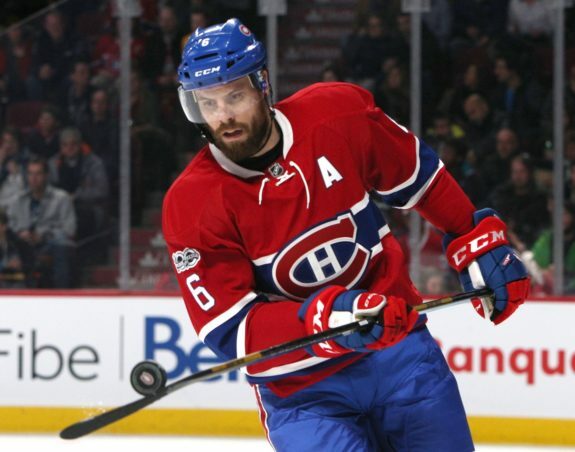 Weber got on the scoresheet in his first game back, assisting on Montreal’s third-period goal. He also had three shots in more than 24 minutes of ice time. Carolina jumped out to a 1-0 lead at 7:45 of the first period when Rask deflected a shot by Jaccob Slavin past Price for his first goal of the season. The Hurricanes improved to 9-2-0 when scoring the game’s first goal. The visitors doubled their lead at 11:59 of the second period on another deflection. This time, van Riemsdyk’s shot went off Montreal defenceman Victor Mete’s skate and in. Down 2-1, Max Domi hit the post with 1:41 remaining in the game. Montreal’s scoring woes continued, as Claude Julien’s men have only managed seven goals in their last four games. Notes: Carolina’s Jake Bean made his NHL debut.